Google has been slowly but surely expanding its fiber optic internet, aptly called Google Fiber, around the country. Originally started in Kansas City, the fiber connection is now available in ten locations, and two more are already on their way. The next two, Louisville and San Antonio, are going to be, however, somewhat different. Google is trying out a new way of offering the fiber package. Unlike previous installments of Google Fiber, the cities in Kentucky and Texas will only be having the superfast internet (up to gigabit) without the TV add on service. According to an official blog post by Google's Head of Sales and Marketing Cathy Fogler this is due to the fact that people are moving away from the traditional TV format and towards more control over how, when, and where they view the content. Of course Fogler specifies the new YouTube TV service but also recognized the likes of Hulu and Netflix as the new age of television. Google also has noticed that more and more customers in current Google Fiber cities are choosing alternative TV or streaming services instead of traditional TV, but for now services in those locations stay as they are. It remains to be seen how this affects the price of Google Fiber in the new cities. 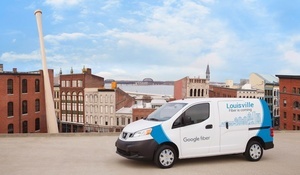 Google is currently constructing the infrastructure for the fiber network in both Louisville, KY and San Antonio, TX.